Merry Christmas and Happy New Year to you from all of us at Webvision. This image, a Christmas wreath created by Robert E. Marc is composed of 104 rod bipolar cell axonal fields from the world’s first complete connectome with synaptic level resolution. 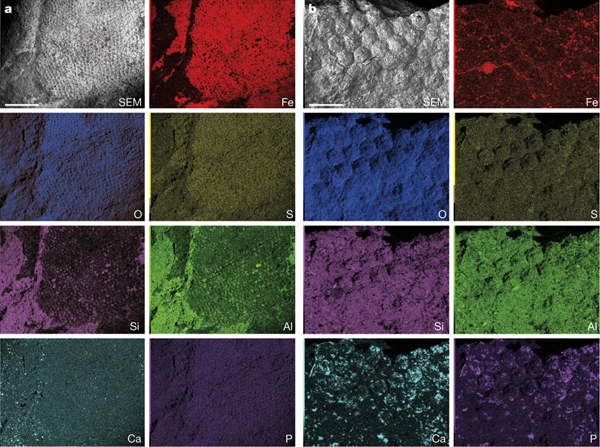 Each bipolar cell in this field has been annotated from ultrastructural data revealing its extent and connectivities to other cell classes. The rod bipolar cells have been rendered out in 3D and is viewed from the top, or photoreceptor side, looking down towards the ganglion cell layer. Friend of Webvision, Peter Westenskow in the Friedlander Laboratory sent us this beautiful image of activated Müller glia in a stressed mouse eye. You can see the scar in the photoreceptor layer towards the top of the image. The mouse line is VLDLR -/-. These mice exhibit aberrant neovascular tufts that invade the ONL and eventually grow into the RPE cells. The red staining is pan-cadherin. 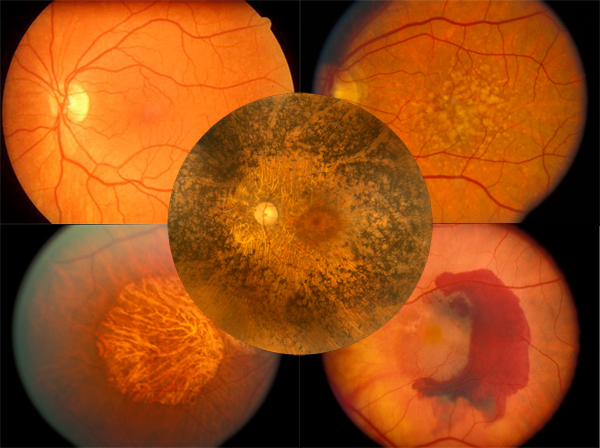 We just received program notice of the XVth International Symposium on Retinal Degeneration that will be held, July 16-20, 2012 Bad Gögging, Bavaria, Germany. Another amazing image sent to us by Gabriel Luna out of the Steve Fisher and Geoff Lewis’s retinal cell biology group at UC Santa Barbara Neuroscience Research Institute. 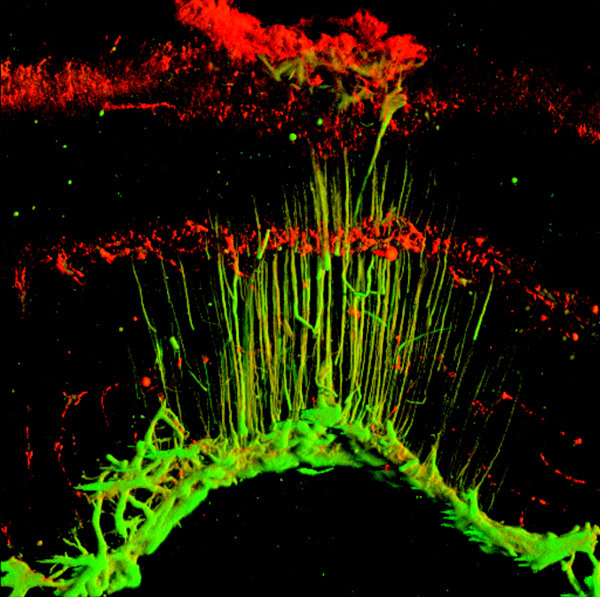 This image is of the optic nerve head of a normal mouse retina displaying the “glial tubes” formed by the astrocytic network (anti-GFAP; red). 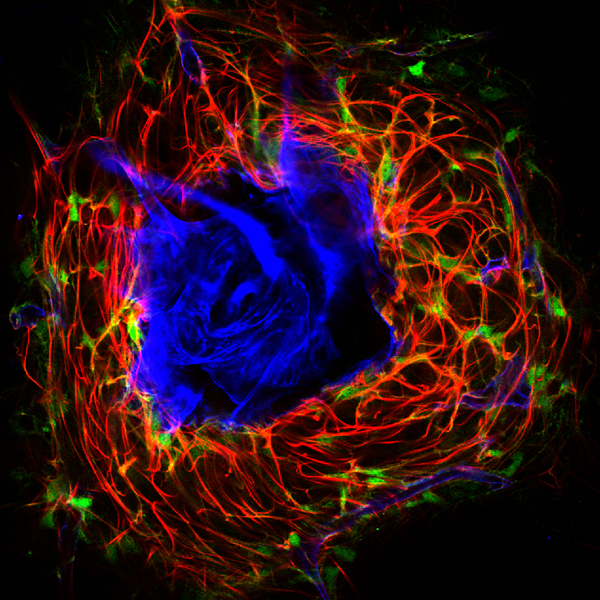 Anti-GFP (green) and anti-Collagen IV (blue) which were used to determine numbers of astrocytes and relative locations in relation to blood vessels.